Edison lighting made an appearance at this years Melbourne Spring Racing Carnival. The designers for Seppelts Winery, a major sponsor of Melbourne Cup Stakes day, approached us to build the lighting for their Birdcage Marquee. A newcomer to the Birdcage, the Seppelts Marquee looked like a contemporary take on a western saloon. 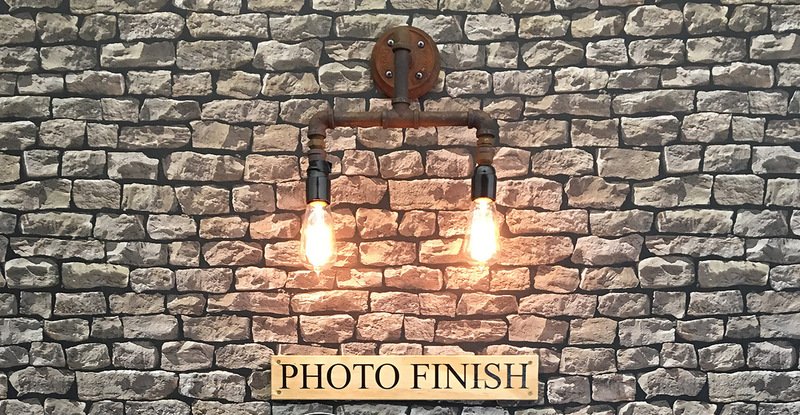 With exposed stoned walls and traditional joinery the use of our industrial plumbing pipe lights and brass wall lights was a perfect choice. There was an added difficulty with this lighting project with the marquee only set up over the two week carnival period . Being a temporary set up the lighting needed to be installed to meet VRC’s safety standards. There is a requirement that all temporary lighting be double insulated. Essentially there was no capacity to allow for lighting that requires an earth. For us this meant removing brass lamp holders and replacing with Bakelite. We wired with double insulated 2 core cable and extra insulating component inside the lamp holder. To meet these requirements our lights were built to allow for plugs to be attached, once tagged and tested installation was simply a matter of mounting the lights to the walls and plugging them in. Once the event was over the lighting was easily removed and ready to be used again for other events. Our thanks to Camilla McMahon from Tall Architects for incorporating our industrial and vintage style fittings into her design.